In this case, the phrase “gone to the dogs” is a great thing. Every year since the Ellipse Arts Center in Arlington, VA opened its’ doors almost fifteen years ago, it has sponsored a juried photography exhibit. This year, for the first time ever, a formal portrait of a dog ran away with the top prize. The subject of the portrait, Aztec, is a greyhound that was adopted from a racetrack in Miami. The award-winning image shows him lounging comfortably on a couch with window-light illuminating his soulful eyes. “People are usually surprised at how beautifully their animals photograph. My goal is to make every portrait I create a work of art,” says Robin Burkett, winning photographer and owner of PawPrints Photography. The juror of the event, Volkmar K. Wentzel, is a world-renowned National Geographic photographer. In reference to judging the show, Wentzel said, “I was mainly guided by my own experience as a news photographer in the days before the wire photo, and the nearly half century that I served as a photographer for the National Geographic Magazine.” The Call for Entries for the 2005 Ellipse Photo Show elicited 540 entries by both amateur and professional photographers working in any photographic mediums who live or work in Virginia, Maryland, West Virginia or the District of Columbia. Juror Wentzel winnowed the entries down to 107, including ten prize-winners. 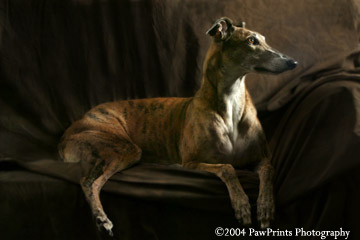 According to Wentzel, “The beautiful, Gainsborough-like photography of the greyhound Aztec Light by Robin Burkett won first place”. This photograph, as well as 106 others by fellow photographers, will be on display at the Ellipse Arts Center, 4350 N. Fairfax Drive, Arlington, VA, through February 26, 2005. For more information, contact Robin Burkett at (703) 354-3736.